There are many different ways one can travel to and from Flagstaff. Therefore, we want to provide resources you may need on your trip to this lovely mountain town! The Flagstaff Airport is located just south of town, in Coconino County, Arizona. It is serviced by one airline, American Eagle, and is also used for general aviation. In addition, starting May 5, 2018, the Flagstaff Airport will have an additional destination, Los Angeles International Airport (LAX) on American Airlines. This will be a non-stop flight, and will only fly on Saturdays and is a seasonal addition as American Airlines determines if the Flagstaff market will support additional service. American's current 70-seat aircraft, which includes a first class section, will operate this route. The flight will depart LAX on Saturday at 2:00 p.m. and arrive in Flagstaff at 3:30 p.m. It will then depart Flagstaff at 4:00 p.m. and arrive at LAX at 5:43 p.m. Starting June 9, 2018, Dallas-Fort Worth International Airport (DFW) will be another destination for American Airlines. This route will be non-stop and only fly on Saturdays as well as we get the Flagstaff market to support additional service. The flight will depart DFW at 11:00 am (Texas time) and arrive in Flagstaff at 11:30 am (Arizona time). The returning flight will depart Flagstaff at 12:45 pm and arrive at DFW 5:15 pm. 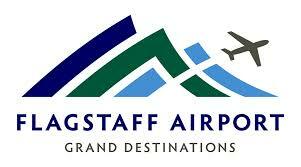 This route will be operated by the same 70 seat aircraft as the other routes departing Flagstaff. The shuttle is a great way to travel to Flagstaff. If you are a arriving in Phoenix and need a ride up north, we recommend Arizona Shuttle. They pick up from Sky Harbor Airport and Metro Center Mall in Phoenix every few hours, 7 days a week. Once you are in Flagstaff or Sedona, you can use Canyon shuttle to get you to the other northern Arizona destinations you would like to visit. Arizona Shuttle will also take you to Sedona or the Grand Canyon as well, but Canyon Shuttle is the new, more friendly, cost effective and personal shuttle service that we like to recommend these days once you get up to Flagstaff. The Northern Arizona Intergovernmental Public Transportation Authority (NAIPTA) is the transit agency in northern Arizona operating the Mountain Line, Mountain Lift and Mountain Link systems in Flagstaff. NAIPTA also coordinates with Campus Shuttle Service at Northern Arizona University. Established in 2001, NAIPTA has grown into a system that employs more than 75 people and transports nearly 2 million riders a year. A great option when it comes to transportation in Flagstaff!